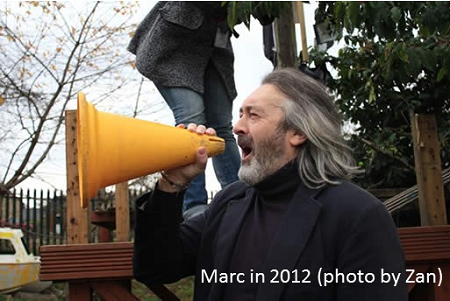 Marc Armitage has been a playworker for nearly thirty years, the last twenty-odd years of which he has been an independent playworking consultant. The following is intended to be a suitably embarassing summary of the last [burble incomprehensible] years. Please do not remind him how old he is. 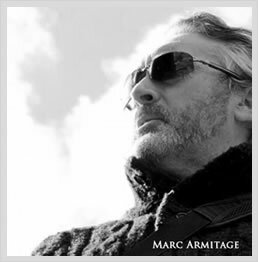 Marc Armitage is an consultant, researcher and writer in children’s play, playing and Playwork. He began his professional career as a playworker in the early 1980s with a local organisation in the UK, Hull Community Playschemes Association, and since then has worked as a field playworker, an adventure playground worker, a double decker playbus worker, a local authority play development officer, a university lecturer, research associate and a company director. Marc became freelance in 1989 first as a mobile games worker and travelled across the UK and other Europe countries on his trusty mountain bike delivering New Games events and training sessions under the name PLAYPEOPLE - taking play seriously. He also delivered Playwork training courses and individual sessions. 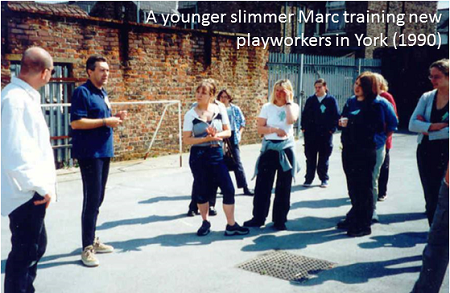 During most of the 1990s and early noughties he was contracted to deliver Playwork skills training in six different local councils in the Yorkshire Region and also authored and coordinated the Stepping Stones to Good Playwork Practice series of accredited training with modules at (UK) Levels 2, 3 and 4 (equivilent to Higher Education Diploma). This program, which was accredited with the Open College Network, was at the time the UKs third largest accredited Playwork training program. After a spell working as the Play Officer for Humberside County Council Marc returned to freelancing and became more involved in policy and strategy development for local and regional government. Between 2002 and 2008 he was involved in the preparation of more than thirty Play Strategies for local councils in all four nations of the UK, in the Republic of Ireland and in Sweden, and was an advisor on the development of Ireland's first National Play Stategy. In 2002 he became the first recipient of the Widdowson PhD. Bursary in Culture and Folklore at the University of Sheffield and was increasingly involved in more academic and research-based initiatives writing more then thirty academic papers and research reports. He served as guest lecturer at a number of universities and as the moderator of the Bachelors Degree in Playwork at Leeds Metropolitan University. Living in Sweden at the time and working across the European Union and beyond Marc was also a research associate with the Högskolan i Halmstad​ (University of Halmstad) and later the Kungliga Tekniska Högskolan (the Royal Institute of Technology) in Stockholm. More recently he is a founding Director of the Australian based Playwork training and advocacy body Malarkey Playwork and still travels the world promoting the importance of play, playing and Playwork in the lives of all children and young people. He is a regular speaker to conference and seminar events around the world and has been published in magazine articles, periodicals, journals, books and academic papers in English and Swedish - some of which can can be found on this website. He is also is a member of the Society for the Study of Childhood in the Past, the History of Education Society and the Folklore Society. Oh, and he speaks to a lot of children as well ... lots of them.